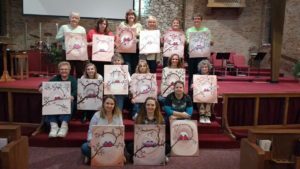 Enjoy a night of painting and fellowship! Participation is only $30 and includes step-by-step instruction, canvas, and paint. Profits benefit our January 2019 mission trip to Real Hope For Haiti. Pre-registration is required. You are considered pre-registered if you text Jen at 740-232-9202 with your name and contact info. Payment not required until the date of the event. If you can’t make the event there are two ways to donate: to give to Real Hope For Haiti, go to https://realhopeforhaiti.org/donate/ or to give to mission worker expenses go to https://www.lancasterubc.org/give/.